RUTLAND – The Vermont Department of Environmental Conservation (DEC) was notified today, Aug. 7, of a release of untreated sewage into East Creek in the City of Rutland. A problem was first identified around noon on Aug. 6 when a routine inspection turned up a suspicious plume of light colored material entering East Creek from the creek bottom in the area of the West Street Bridge. The Agency of Natural Resources was notified. Dye testing showed that the leak was coming from an abandoned sewer pipe. The pipe was found to be receiving wastewater through a connection that was sealed in 1970. The seal had apparently failed, slowly filling the pipe with sewage, and eventually leaking into the creek. DEC staff and city officials are presently on-site investigating the incident and repair activities have been initiated, according to the release received just after 3 p.m. Friday, Aug. 7. Up to an estimated 150,000 gallons of sewage was discharged to the East Creek, which empties into Otter Creek approximately one half mile downstream, environmental officials estimate. The Vermont Department of Health has been notified of the release, and in consultation with DEC, has determined that the potential for a health hazard exists. 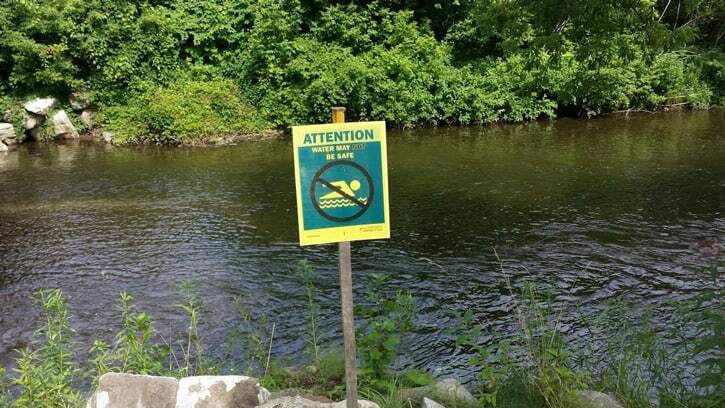 People should stay out of the water and not swim in it, or use it for recreational purposes from Rutland to Proctor for 48 hours after the sewage release has been stopped. Health Officers for Rutland City, Rutland Town, and the Town of Proctor have been notified, and the stretches of river from the point of release downstream to Proctor Dam will be posted with signage warning the public to avoid contact. 2. On Monday (weather permitting) the department will temporarily bypass and clean out the manhole structure. The leaking connection will be properly sealed. 3. The DPW Engineering Division will develop plans for the replacement or refurbishment of the manhole structure, which will be undertaken as soon as possible. It is not known how long the pipe has been leaking but the area is inspected frequently due to critical wastewater infrastructure in the area and concern for failures such as this. The exact volume of sewage that entered East Creek is also unknown. People should avoid contact with the water in this area until the repair is completed and the notices removed.